Golconda Fort Hyderabad is an outstanding example of brilliant engineering and magical architecture. Located at a distance of 11km from the city, it is the most famous of all Hyderabad sightseeing places. The name of the fort has been derived from the Telugu words "Golla" and "Konda" which together means 'Shepherd's Hill'. Founded in the approximately 12th Century by the Kakatiya Kings, this massive Golconda Fort with eight gates and 87 bastions was later built by Qutub Shahi Kings. One of the Hyderabad’s most popular and supreme monuments, Golconda Fort allures every visitor with its unparalleled beauty and grandeur. A Hyderabad Tour is incomplete without a visit to this fort. However, do keep in mind the Golconda Fort timings and entry fee before planning a visit to this regal symbol of history. For instance, Golconda fort timings are from 9 am to 5.30 pm. After that, visitors are not allowed to enter the fort, unless they are going for the light and show in night. Hence, to explore the beauty of this place at leisure, plan you visit early in the day. With perimeters of around 11 kilometers, the fort has 15 to 18 foot high walls. It has huge gates that have pointed iron spikes on them. This protected the fort from Elephants damaging the fort as well as enemy attacks. The fort presents a mesmerizing architecture which will astonish you at each and every step. Its also recommended to visit other 2 nearest sightseeing places from Golconda fort, which are Qutub Shahi Tombs and Taramati Baradari. The system of acoustics in the Fort is something which attracts each and every visitor. The sound of clapping at the entrance can be heard at the ‘Bala Hissar' which is the highest point and almost a kilometre away. This system was apparently used for communication purposes, especially to alert royal in case of any attack. Other attractive features of the Fort include water supply system as well as famous 'Rahban' cannon. Ramdas’ prison is one of the popular spot inside the fort. According to legend, Ramdas who was a revenue collector in Abdul Hasan Shah's court was imprisoned. During his imprisonment, he carved Hindu deities on the wall of his cell. 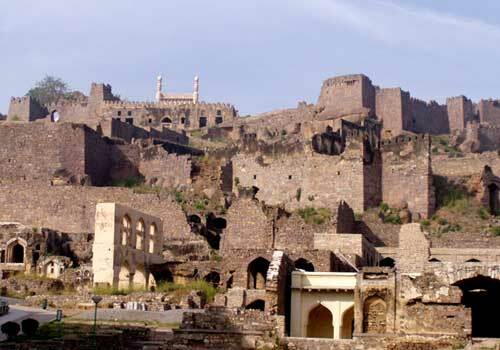 It is said that Golconda fort used to be a famous diamond market attracting merchants from all over the world. It was at Golconda that the famous Kohinoor and Hope diamonds along with others such as The Regent Diamond, Darya-e Nur, Nur-Ul-Ain Diamond were stored. Another feature that makes Golconda fort all the more attractive is the light and sound show presenting its history and facts. The sound and light show at Golconda Fort is done in three languages namely English, Hindi and Telugu with a voice over of Bollywood living legend Amitabh Bachchan. The show timings of sound and light show at Golconda Fort are Show Timings (Nov to Feb): 1st Show 6:30pm 2nd Show 7.45pm & Show Timings (Mar to Oct): 1st Show 7:00pm 2nd Show 8.15pm. What I like the most about Golconda Fort is the view you get from the top. You can see the entire city. I loved that...it was cool day...the breeze and the view made it perfect for me. It would have been better if tourists are allowed in night too...the view in night would be even better I am sure. Actually golkonda fort timings are only till 5.30 pm thats why I had to come down early. openness of the fort is also quite likeable. 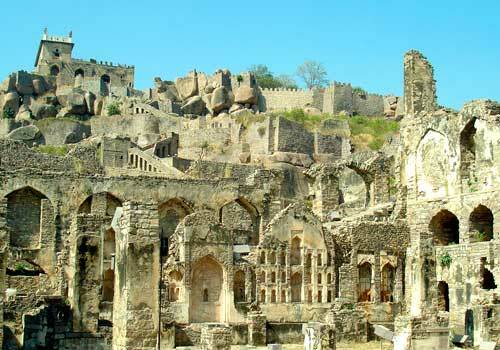 Golconda Fort is an important part of Hyderabad History. I went to visit this fort on a weekend. Weekends seems usually crowded so if you can visit during the week. But the visit was worth. I reached the fort by afternoon itself as I knew that timings of golconda fort are from 9 am to 5.30 pm so wanted more time to explore the place. although it was sunny, I saw every part of the fort. It is captivating! No doubt this fort is beyond comparison. I loved the architecture, its vastness..it even has a temple inside it! But it requires a lot of walking. if you really want to see the place you should climb upstairs and see. In summer that is not a good idea and as the Golconda fort timing for entry are only till 5.30 pm you cannot even go in evening. I would suggest you to go after the month of april and may. If visiting during summer, plan for an early morning visit only, afternoon you can’t bear that much heat. Golconda fort is no doubt one of the best forts i have seen till now. What I loved the most about this fort was its light and sound show. The show is in all the three language- Telugu, hindi and English and in the voice of Amitabh Bachchan. It gave us details about the fort and its history. It was a different experience. Before going please do check the sound & light show timings..
Golconda Fort was built about 400 years back, I visited with my family. I wanted my kids to see the grand monument from past and understand its value. After seeing it I can confidently say it is one of the most beautiful buildings of the city...In-fact in entire India. You can visit this place on all days of the week but the entry timings are from 9 to 5.30 only. Golconda fort entry fee is minimal so don’t worry about it. But yes, you need to pay extra if you are carrying a camera inside which is also quite less. Truly speaking even if the entry fee was more i would have gone there for sure. This fort is worth the visit. Golconda fort is beautiful. And what makes it even more beautiful is the fact that is well maintained. I would recommend that this fort should be in everyone’s travel itinerary. 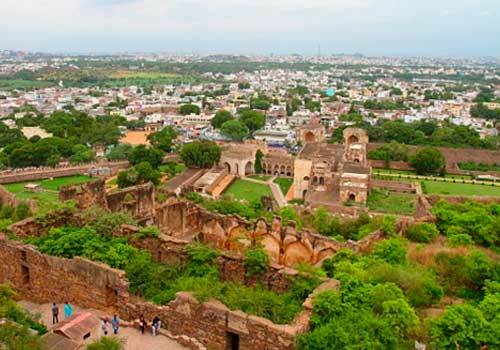 We thoroughly researched on various places and things like golconda fort timings Hyderabad and then planned our travel with all the list that you can do on your visit to Hyderabad. Unlike other forts, you have place to sit, snacks stalls and cold drinks stalls are also there. It makes it easier to explore the fort...you can take breaks and enjoy the experience at your own pace.